Spider-Man: Homecoming’s willingness to to sidestep the history established in Sony’s two other takes on the webhead and get Peter Parker back to his awkward, teenage roots is a large part of what makes the movie as refreshing as it is. But there’s one thing about Homecoming’s Spidey that’s a little off. Technically speaking, Spider-Man doesn’t have any canonical super-weaknesses that can incapacitate him the way that Kryptonite does to Superman. Instead, it’s everyday human things like deadlines and needing to refill his web cartridges that tend to trip Spider-Man up. Though it isn’t mentioned nearly as often as his other pet peeves, there’s a longstanding tradition of Spider-Man not knowing how to drive that Homecoming’s marketing slyly acknowledges before dismissing it in favor of trying to sell some cars. About two-thirds into the movie, there’s a scene where Peter, realizing that there are no tall buildings for him to swing from in order to get from his neighborhood to where the Vulture is, steals a car and shows off what a terrible driver he is as he jerkily tries to navigate the car down the street. The issue with Homecoming’s depiction of Peter’s lack of driving skills has less to do with the movie itself and more to do with an Audi advertisement seemingly meant to take place within the MCU, in which we actually see Peter Parker at the Wheel Teach Ya driving school waiting to take his exam. After watching “found footage” of himself in costume crashing a car into a series of trash cans, civilian Peter hops into the “prototype” Audi he borrowed from his friend Tony along with the driving instructor (J.B. Smoove) and proceeds to show off just how bad a driver he is... and how the Audi can compensate for him. When Peter takes his eyes off the road to talk to the instructor, the car automatically slows to a stop before they can crash into another vehicle. After activating the Audi’s “Audi-intelligent” auto steering, Peter takes his hands off the wheel and is promptly docked a couple of points for being irresponsible. Ultimately, Peter passes the exam after activating the car’s auto-parallel parking feature that doesn’t actually require him to steer the vehicle. On its own, the ad is innocuous and actually rather impressive if only for the fact that it manages to feel like a deleted scene from the movie itself. But the fact that it’s a commercial for a car that Spider-Man would drive is sort of at odds with how Marvel’s handled Spider-Man and cars in a larger sense for the past 40 or so years. Spider-Man’s Spider-Mobile was introduced in Amazing Spider-Man #126, when Spider-Man was approached by a car company that wanted him to build them a fuel efficient vehicle styled after him. On the page, the Spider-Mobile read like a silly nod to the popularity of other superheroes with custom cars and the like. In reality, though, the car was created in an effort generate new revenue streams for Marvel. In the comics, Spider-Man ends up building the car after realizing that he’s got bills to pay and needs the cash. But the idea of the Spider-Mobile existing somewhere in the universe was so ludicrous that Conway essentially got rid of the car within a few issues by having Spider-Man literally drive it into the Hudson River. To be fair, Peter fishes the car out of the river eventually and gives it to the company that hired him to make it, but since then, it’s not often that you see him stuck in midday traffic behind the wheel. 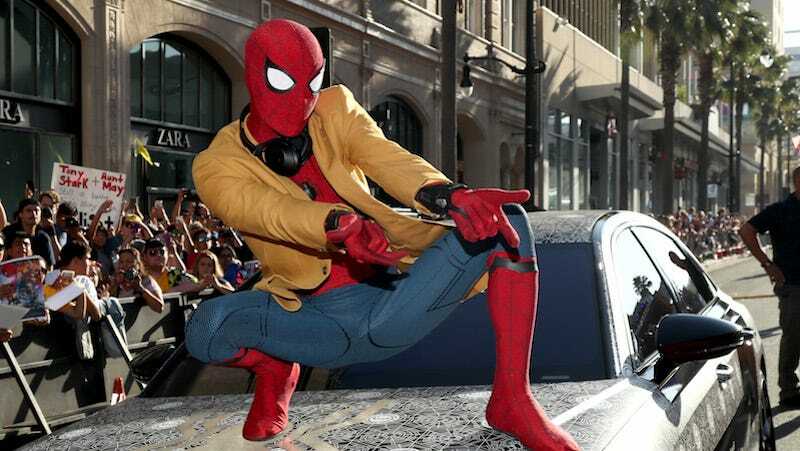 As much as it might not sit well with Spidey traditionalists, Peter’s kinda sorta (but not really) driving with the help of a technologically advanced car fits in line pretty nicely with Homecoming’s take on Spider-Man. This Spider-Man already uses quite a few more gadgets than his predecessors, so why wouldn’t he sometimes zip around in a semi self-driving car? How else is he going to get to the Avengers compound in upstate New York?